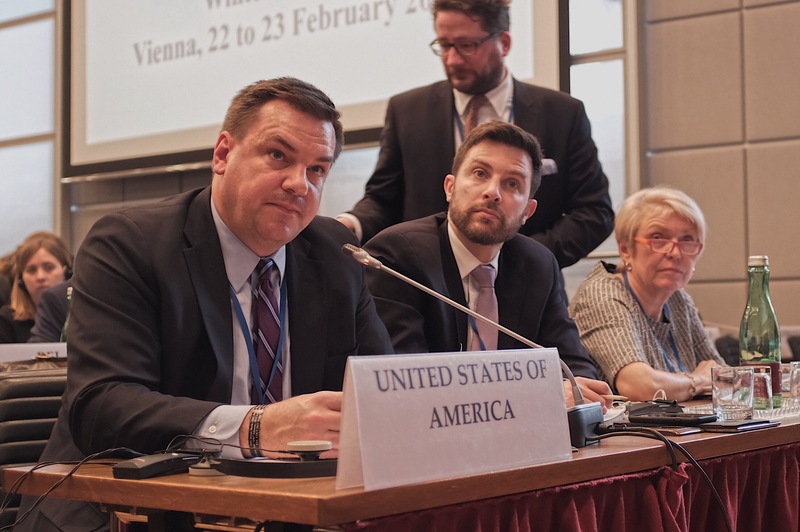 On February 22 and 23, 2018, approximately 240 parliamentarians from 53 countries in North America, Europe, and Central Asia met in Vienna, Austria for the 17th Winter Meeting of the OSCE Parliamentary Assembly. Helsinki Commissioner Rep. Richard Hudson (NC-08) represented the United States and actively advocated for U.S. positions and expressed U.S. concerns regarding challenges to security and cooperation in Europe, including Russia’s clear, gross, and uncorrected violations of Helsinki principles. Established in 1991, the OSCE PA is the parliamentary counterpart to the multilateral diplomacy that takes place under the auspices of the OSCE. 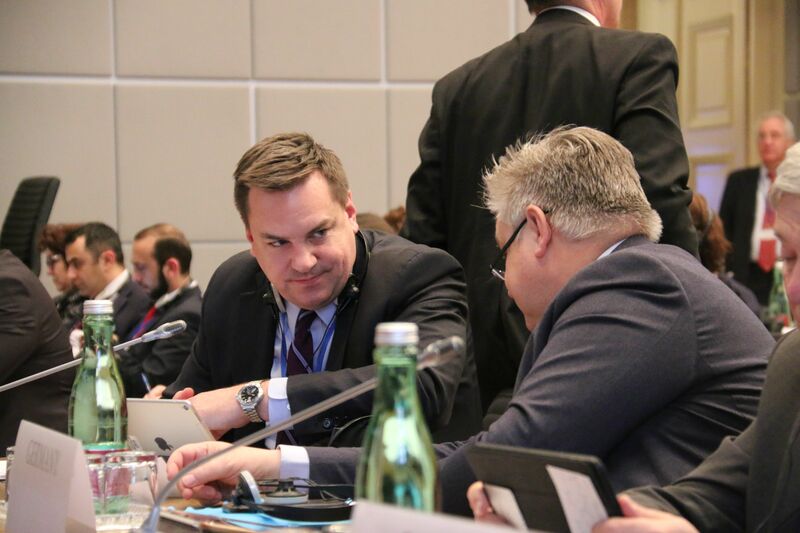 By meeting each winter in Vienna—home of the OSCE Secretariat—the OSCE PA fosters parliamentary interaction with OSCE officials and the diplomatic representatives of the 57 participating States. The first OSCE PA meetings of the year, and second in importance only to the annual session held each summer, Winter Meetings allow parliamentarians to prepare their work for the coming year and debate issues of immediate concern. Rep. Hudson spoke in all formal sessions of the 2018 Winter Meeting and in the meeting of the Ad Hoc Committee on Countering Terrorism, where he serves as vice-chair. During the meeting’s opening session, he forcefully denounced Russian aggression against its neighbors and expressed strong support for the OSCE’s Special Monitoring Mission in Ukraine. Later in the Winter Meeting, Rep. Hudson noted the third anniversary of the murder of Russian opposition activist Boris Nemtsov in Moscow. Condemning the continued imprisonment of American citizen and fellow North Carolinian Pastor Andrew Brunson in Turkey, as well Turkey’s recent sentencing of NASA scientist Serkan Golge, Rep. Hudson called for their immediate release and a continued focus on outstanding human rights cases arising from President Erdogan’s assault on democracy in Turkey. He also supported greater energy security through diversification of sources, outlined the U.S. approach to the challenge of nuclear proliferation, and suggested ways for the OSCE more effectively counter terrorism. OSCE PA President George Tsereteli of Georgia, who recently visited New York and Washington, welcomed active U.S. engagement and credited the Helsinki Commission for turning OSCE PA efforts into diplomatic initiatives which can directly improve people’s lives. The next meeting of the OSCE PA will be its annual session, scheduled for Berlin, Germany, in early July.